MAK IT provides full cycle services for software development. The company grows very swiftly, and to maintain stable development pace, short term financing is necessary for current assets. We were positively surprised about the quality and speed of service when we started collaboration with Cityfinances. Funds were transferred to our company account within 5 days after submitting the application. Cityfinances is our financial consultant; we have gained a trustworthy and safe collaboration partner. 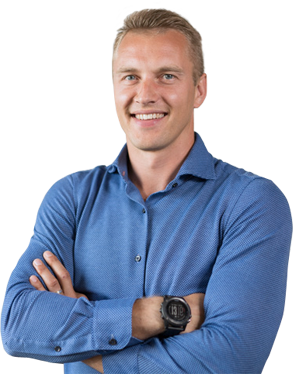 Ivars has got two Master’s degrees in Business and Management. He has advised technology, logistics, manufacturing, and sales companies as well as companies representing other fields of business in implementation of more than 100 business projects. For the past 15 years he has collaborated with companies in Europe, China and Russian FMCG segment, provides consultations on new brand integration in the market, effective sales structures, establishment of logistics chain and financing businesses. Ivars invests his knowledge and experience as well as uses his business contacts to ensure achievement of planned results for each client. Cityfinances Business loan is a friendly loan for advancing your company and boosting business growth. Insufficient finances are often the reason for slowed business growth and could negatively affect development of your company. To avoid that, Cityfinances consultants have developed the Business loan solution, which is specifically intended to meet the needs of small and medium size companies of any field of business. Apart from other financial institutions that prefer projects with lower risk and require securities, Cityfinances Business loan is a perfect chance to advance your business in its development phase when it is so crucial to have fast access to financing for jumpstarting new projects. Our Business loanwill also help to speed up the pace of your business, expand manufacturing and materialize bold innovations. Thisis a comfortable solution with friendly interest rate that is easier to receive. Terms for Business loansare applied individually. We, Cityfinances, believe that realization of long-term quality projects is the driving force of any business, therefore we will help your company grow! Necessary documents: operating balance, profit or loss statement, bank statement, short project idea description that includes a motivated statement of the reason for financing, as well as the planed repayment term. Other expenses: in accordance with the price list. *In the event a larger loan amount or longer repayment term is necessary, we encourage you to contact our consultants. By conducting a case by case evaluation, it is possible to receive an individual Business loan offer that is made just for you. Clients who use the Business loan solution for the second time can receive 30% discount of the processing fees. Fill out the application form on Cityfinances webpage. Filling out the application form for receiving Business loan will only take 5 minutes. 2. We will review your application within 2 hours. After verifying all information, Cityfinances consultants will review your application. If the project is accepted, we will prepare an offer. We will provide a response on availability of a Business loan and its terms within 2 hours to one day. After signing the contract, Business loan amount will be transferred to your account within 1 hour. The transfer takes approximately 1 day, depending on the receiving bank. What kind of companies Cityfinances Business loan is suitable for? Cityfinances Business loan is suitable for financing and encouraging growth of small and medium size companies of any field of business. Cityfinances ensures friendly and accessible loan to any entrepreneur, therefore we encourage you to get in contact with our consultants to find the most suitable solution for you. 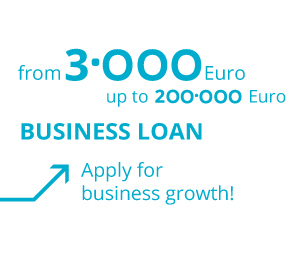 Cityfinances Business loan is friendly and available and is ranging from EUR 3000 to EUR 200 000 with interest rate of 1.5% per month, and term – up to 2 years, and is available for companies of any field of business for encouraging their business growth and advancement. Do I have to pay for application review? Applications are reviewed free of charge. You also have an opportunity to receive free consultations and information on other Cityfinances financial services. How is interest rate determined for a Business loan? Interest rate is determined for each company individually. Our consultants have developed a unique project review method, which is based on scoring and uses various parameters for creating an individual offer. In such way, the interest rate is determined in a fast and effective manner. Companies that meet their loan obligations timely and responsibly receive exclusive offers. Is it possible to repay the Business loan before term? Yes, it is possible to repay it before the term listed in the contract without additional penalty fee. What is the possible term for issuing a Business loan? Standard term ranges from 1 month to 2 years. However, if a longer term is necessary, our consultants will tailor the term to your individual needs. Are there any fields of business that Cityfinances do not cover? Cityfinances clients represent a wide range of fields of business. The requirement is that the applicant is a company registered in the Republic of Latvia. My company needs a Business loan that exceeds EUR 200 000. Is it possible to receive larger amount? Cityfinances mitigates lender risks, however, in certain cases it is possible to receive a quick Business loanup to EUR 1 000 000. In such cases, we encourage you to contact our consultants for individual application review. Do you finance companies with financial difficulties? We evaluate all reasons the company is having financial difficulties and what is being done to overcome it and not allow it to happen in the future. It is important to see if the entrepreneur is seeking financing to repay the loans, or he has a plan on how to resolve the situation and start earning. In such cases Cityfinances carefully evaluates risks associated with the project as well as the entrepreneur profile. In accordance with requirements laid down in laws and regulations, we encourage you to evaluate your ability to take on more financial obligations and repay it, so you do not worsen your existing financial situation. What to do if I have a negative credit history – I am included in debtor data base? In such case we look at the status of your debt. If it is cleared and your company dynamics are positive, then a negative note in debtor data base will most likely not create any problems for receiving a Business loan. If you have existing debt then we will evaluate the difference between the debt amount and company turnover and profit, as well as –the reason for not paying the debt. Our traditional practice is to encourage entrepreneurs to clear their existing debt before applying for new loans. Is it possible to combine several liabilities witha Business loan? It depends on the exposition of the existing loans against existing securities as well as the current loan amount against company profit. Such cases are treated individually depending on the project and previous payment track. By what criteria do you evaluate projects? Cityfinances consultants have developed a unique methodology for evaluating projects, which is based on scoring. This method allows for fast and effective project evaluation. In case of very specific projects, we involve experts from different fields.